Among the most culturally rich countries in the world, France brings together world-class museums, various art attractions, natural beauty, and a unique leisure aesthetic. The romantic, scenic walks in the artsy Left Bank of Paris are in nice contrast with the idyllic, verdant countryside of Provence. Based on our family’s recent travels in France, our most loved properties are the Right Bank Le Bristol Paris, the Left Bank Relais Christine, the Provincial La Mirande, and, of course, the magnificent Hotel du Cap-Eden-Roc in Antibes. Upon arrival in Paris, you will be privately transferred to the Right Bank 5-star Le Bristol Paris or the 5-star Left Bank Relais Christine. Get your bearings in Paris with a half-day private tour including a stopover at the Eiffel Tower for an up-close look-see, then travel to the 15th Arrondissement and ascend to the top floor of Montparnasse Tower for the most spectacular views of Paris and the Eiffel Tower. Though we very much enjoyed the “skip the line” time-saving benefits of visiting the Eiffel Tower in the past, this special feature has become meaningless due to its exploding popularity and feel an elevator ride to the top of Montparnasse Tower to be much more pleasant. Your tour will end to a visit to Paris’ eerie Catacombs. While we feel this experience to be interesting and enlightening, please be advised that those who suffer from any degree of claustrophobia might not feel comfortable here. Following breakfast, you will take a tour of some of the most notable sites in Paris. Your tour will begin with the Notre Dame Cathedral, a masterpiece of French Gothic architecture. You will walk down the Rue de la Huchette, one of the oldest streets along the River Gauche, before continuing on to Les Invalides, a massive complex of museums and monuments related to the military history of France. Visit the Louvre, the world’s largest palace, and the greatest museum housing such notable works of art as the Mona Lisa, Venus de Milo, and the Winged Victory of Samothrace. Following breakfast, you will take a tour of Paris’ 4th and 17th Arrondissements. Starting with the 4th Arrondissement, Marais, you will explore the city’s long-established Jewish quarter (“Pletzel”) with expensive, fashionable boutiques juxtaposed to quaint Jewish stores, bookshops, and butcher shops. Your next stop will be the northern 17th Arrondissement of Montmartre, with a bohemian vibe, Paris’ hilltop neighborhood in many ways is quintessentially French with petite cafés, serene squares, and art around every corner. You will continue to Pere Lachaise Cemetery in the 20th arrondissement, home to the graves of such notables as Chopin, Oscar Wilde, and Jim Morrison! Later in the day, you will head back to Paris’ city center to explore the bohemian Latin Quarter, followed by an amble in the Luxembourg Gardens. Following breakfast, you will be met by your guide and transferred to the Palace of Versailles. Versailles is beyond compare: 700 rooms, 67 staircases, 352 chimneys, 2,153 windows, 6,300 paintings, and 2,100 sculptures and statues. Versailles has become a symbol of the absolute monarchy of the Ancien Régime. Most impressive here are the spectacular gardens covering 1976 acres, designed by André Le Nôtre in 1661! You can find more information about Versailles in our blog post here. Following breakfast, you will be met by your private driver and transferred to the Paris train station to board the high-speed TGV to Avignon, Provence, an approximately three-hour ride. Upon arrival in Avignon, a small provincial town surrounded by a lavish countryside, you will be met by your private guide for optional private touring before being transferred to La Mirande. Today you will be met by your private driver for a full-day of Provence private touring beginning with St. Remy, originally known for its most famous son, Nostradamus, and home to the sacred archaeological Roman site Glanum, just outside the city. Two of our favorite stopovers here are Joel Durand Chocolatier and Le Bistrot Du Paradou. As you return to La Mirande, you will stop at the town of Bonnieux. From the 12th-century Roman/Gothic Church “Vielle Eglise” at the top of Bonnieux, one can see sweeping views of the valley floor with its patchwork of orchids and vineyards. Following breakfast, you will set out for L’Isle-sur-la Sorgue, a unique medieval town well-known for its flea markets and high-quality antique shops. You will continue on to Gordes, famous for its stunning Lavender Route — a wide blue-purple swath that connects over two thousand producers across the Drôme, the Plateau de Vaucluse, and the Alpes-de-Haute-Provence. Your Provence tour will end with a visit to Menerbes, a “perched village” in the center of the Luberon region of Provence, similar to much of the Luberon area’s “hill villages”. Following breakfast, you will be met by your private driver and transferred to the Hôtel du Cap-Eden-Roc Hotel. You will first stop at Aix-en-Provence. In contrast to the many villages/hill towns of the Provence countryside, Aix seems like a big city (although its population is only 145,000). Perhaps our favorite artsy city in all of Southern France, Aix has the feel of the Left Bank in Paris, with its chic, leafy boulevards and public squares lined with 17th/18th-century mansions. You will then have the remainder of the afternoon free to enjoy the amenities of the Hôtel du Cap-Eden-Roc. Enjoy the amenities of the luxurious Hôtel du Cap. Your tour will begin with a visit to Grasse, with a population of approximately 53,000, this relatively small hilltop town is today one of the world’s main assembly points for raw materials/components used in making perfume. You will then continue on to St. Paul de Vence, one of the oldest medieval towns in the French Rivera. Home to both Chagall and Picasso, the cobbled, narrow streets here are full of wonderful galleries, restaurants, and museums. Your final Provence stop will be Eze, named for the goddess, Isis, whose cult supposedly worshipped in this place during the pagan era. Rising 1,400 feet above the sea, the view from this idyllic place is truly breathtaking. 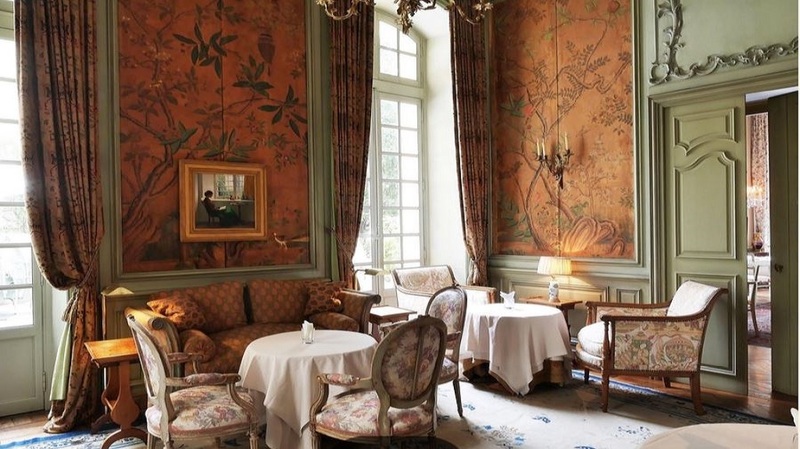 We feel that the 190-room Le Bristol (yes, the one from Midnight in Paris!) to be our favorite luxury 5-star hotel in Paris. Opened in 1925, the hotel occupies an 18th-century building near the shops of the Rue du Faubourg Saint-Honoré. We consider the airy, iconic Le Bristol to perfectly illustrate French culture and service. Though the Deluxe Suite here is our favorite, each room is individually decorated in a traditional style with Persian carpets and colorful toilets! In addition to two other notable restaurants, we especially like the hotel’s café and garden restaurant. Amenities include a high-quality, three-floor spa and fitness center, but we feel the property’s sixth-floor, nautically-themed pool opening onto a solarium, is the property’s most impressive feature! Much has changed at the 5-star, 48-room Relais Christine since our last family visit in 2013! Occupying a former 16th-century abbey in a quiet section of the trendy Saint-Germain-des-Près area of Paris’ Left Bank, the hotel is a short walk to the Seine and Pont Neuf bridge. The property recently completed a major renovation including rooms with updated walk-in showers, an expanded Spa Guerlain (Located in the vaulted cellar), Finnish Sauna, and exercise room. Based on feedback from clients who have recently stayed here, the critical thing that has not changed is the warm and inviting atmosphere and service. It is no hyperbole to say that a stay at the Relais Christine is like staying with family friends. Though usually fully booked, our favorite rooms are the Garden Suites, opening onto the private lawns enclosed by clipped hedges. Many believe the Hôtel du Cap-Eden-Roc to be the most sought-after summer retreat in the world, and our clients would agree. Yes, the Hotel du Cap is expensive, pretentious, home to global celebrities and jet-setters, AND, we feel, among the most beautiful hotels we have stayed at anywhere in the world! Despite the 55 Euro cost of a cheeseburger at the Eden Roc pool grill; our Lynch family has fond memories of our last stay here. Located in Antibes, Hotel du Cap is 45 minutes to an hour away from St. Jean Cap Ferrat, which is just on the other side of Nice. The reputation of Hôtel du Cap is maintained in part because of its idyllic location, but perhaps more significantly, due to its reputation for high-touch, understated service. Owner/proprietress Maya Oetker personally decorates each of the 118 rooms and has maintained a level of excellence that is unimaginable, even by 5-star luxury hotel standards.